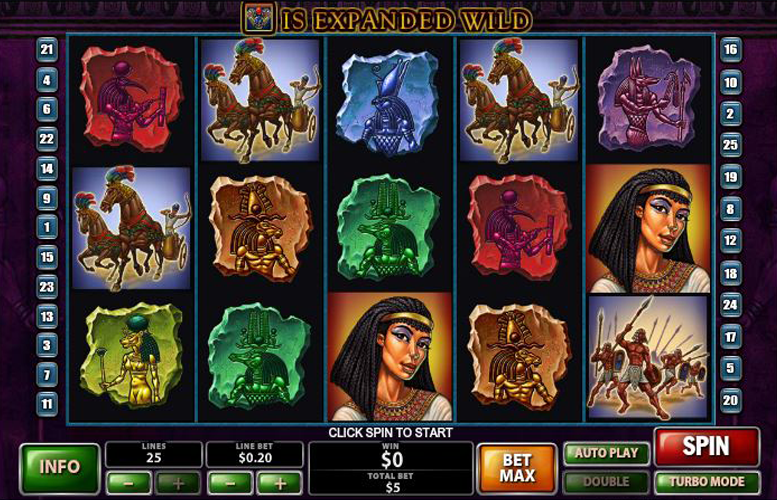 The theme of ancient Egypt makes a great one to base a slot machine around. Exploring tombs, lost treasures, mythology, gods, and kings make for a great many opportunities for excitement. The Pyramid of Ramesses slot machine from Playtech uses this theme to its advantage creating an atmospheric game with plenty of thoughtful bonus rounds. The action itself takes place over a three row, five reel board, and payments are made by hitting winning combinations across one of 25 potential win lines. In addition to the generous top jackpots and bonus rounds available, there is also the chance to win a life changing progressive jackpot too. Great selection of bonus games. Free spins, progressive jackpots, and a few other little treats make this one of the most feature-rich titles around. Atmospheric title that uses its strong symbol imagery, music, and backgrounds to great effect. Low upper betting limit. The £25 maximum bet per spin will not even begin to excite the highest rollers around. Pharaoh = 15,000x the line bet. Queen = 1,000x the line bet. Warrior (chariot or on foot) = 800x the line bet. 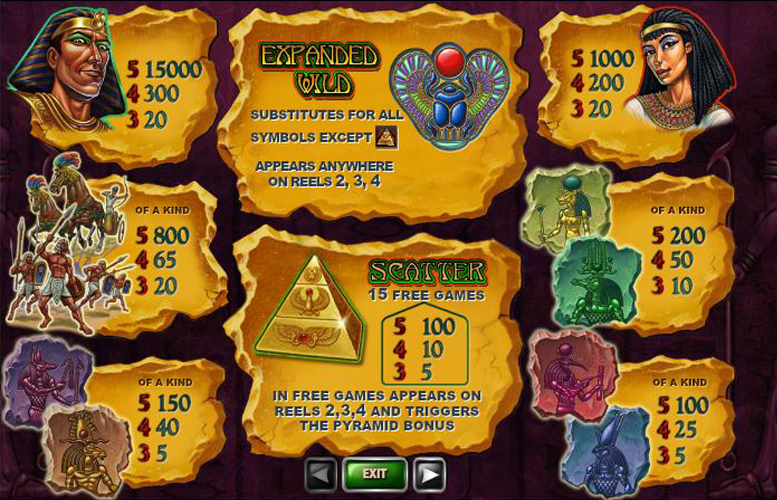 There are some great special features on The Pyramid of Ramesses slot machine. There’s the typical free games mode, and an option to gamble winnings. In addition, there’s a pyramid bonus stage, as well as a progressive jackpot up for grabs. Landing three or more pyramid scatter symbols anywhere on reels two, three, and four at once will trigger fifteen free games. These begin automatically and cannot be retriggered. Landing the pyramid “scatter” symbols anywhere on reels two, three, or four during free games will trigger an additional game called the Pyramid Bonus. During this feature, players must select one stone from each row of stones for a cash prize. If they select “collect”, the bonus ends. If the player manages to reach the top stone before the bonus ends, an additional 200x the total bet is awarded and the round ends. 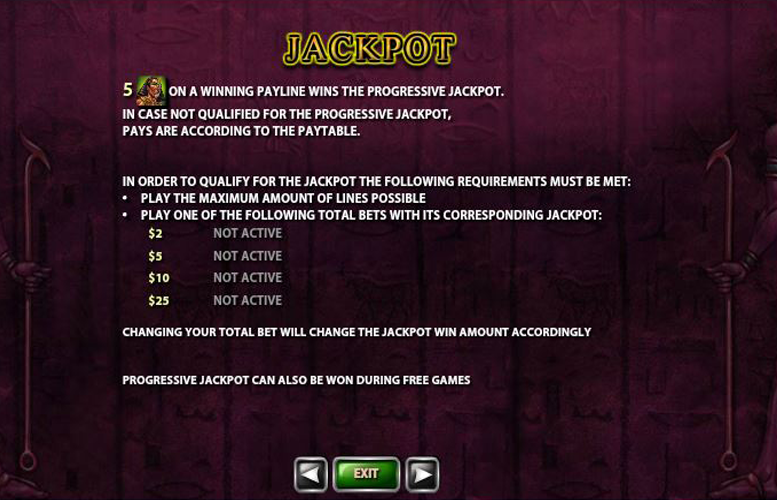 Landing five Pharaohs on a winning pay line wins the progressive jackpot. Players must first ensure they’re eligible, or the same combination wins the 15,000x the line bet quoted in the pay table instead. To qualify for the jackpot, players must use the maximum number of lines possible. In addition, they will only be eligible for the progressive jackpot associated with the stake they play. The minimum here is £2 total bet. The Pyramid of Ramesses also features the option to gamble any winnings awarded on a single spin. To do so, players must successfully pick a higher card than the dealer in a simple guess the card game. Players wishing to gamble their prize must first win some funds, then hit “double” located next to the “spin” button. Following this, they’re shown five cards face down and given the options “collect”, “double half” or “double”. The left-most card is the dealers, and after selecting the amount they wish to gamble (half, or all the winnings), they must then choose one of the four remaining cards. After picking, the dealer reveals their card and the player’s is turned over too. 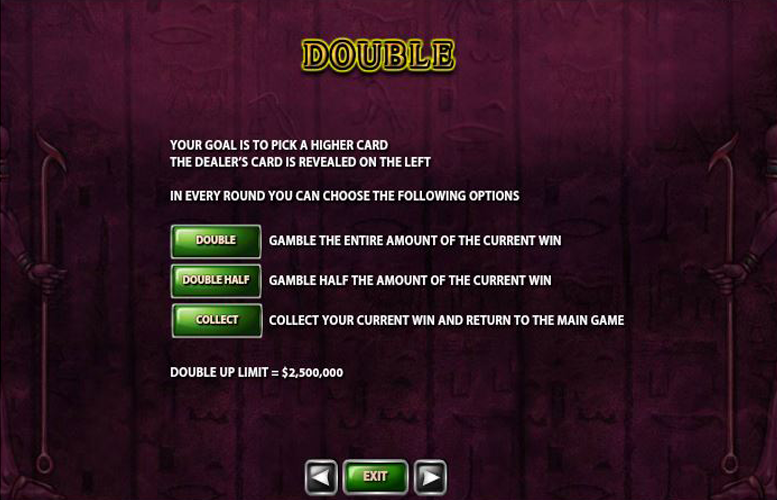 If the player’s card is higher, they are presented with the same options to repeat the gamble, or collect their newly increased prize. If they lose, they are returned to the main game with any remaining winnings. Yellow or Green = 300x the line bet. Purple of Brown = 150x the line bet. Red or Blue = 100x the line bet. Players can adjust both the number of active pay lines used on every spin, and the amount of cash they wish to wage on each. The maximum and minimum lines that can be used on this game are 25 and one respectively. Meanwhile, the minimum possible bet per line is just 1p and the maximum is £1. This makes the lowest bet per spin possible a tiny 1p, and the highest, a not much more impressive £25. Clearly, The Pyramid of Ramesses is not tailored for the highest rollers out there. The Pyramid of Ramesses is a great game with lots of interesting features that make it enjoyable on repeat visits. It’s not one of those titles that offers a progressive jackpot and assumes that that’ll be enough to keep players interested. There are several different side games to play in addition to the big money winning combination. The look and feel of the game lends itself well to the subject matter, and this in turn ties in with some of the bonus features. The result is a solid title that is only really let down by its feebly low maximum bet per spin. If players could wage a few hundred pounds per spin, this machine would be right in there amongst our favourites. This game has a rating of 5 / 5 with 567 total reviews by the users.